This one seems pretty difficult to evaluate. The -7 is quite strong, but at what point is it no longer worth it? Feels like this one is needs to be played around with quite a bit before we know how good it is. With a 3-cost, this seems really good. The -7 isn't an immediate game-ending effect, but you could easily activate it the turn after you play him. And it's certainly a powerful effect, especially if you're digging for a combo piece. The -1 has great synergy as it's not making something irrelevant like Pest tokens. The only real downside I see is that the +1 ability doesn't actually DO anything. This reminds me of Huatli, Radiant Champion. Huatli acually does something, it gains more loyalty, and fast. This becomes dependant on your ability to attack to do anything. This reminds me of Jace (The very bad Ixilan Jace), I don't get putting + abilities on planeswalkers that require attacking in colors that typically don't attack. I'm just happy it's not another 5 mana +1 draw -3 kill -9 win game walker. I have no idea if it's good or not (I'm leaning not), but I'm happy you can't just throw in any deck with U/W. I could see this fitting in a shell with Sai, Master Thopterist. 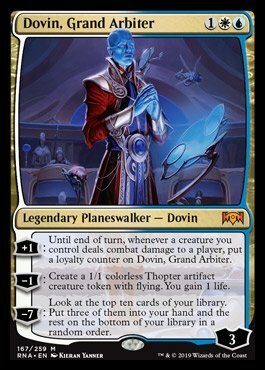 Creating multiple flyers and being able to boost dovin to high loyalty within a single turn. The big draw back though is that we currently do not have a bunch of good artifacts to pair with Sai, like we did previously before the last rotation. it could be really good with double strike. This seems excellent in a token deck. When you got a board just attack and +1 it, if you got none it creates a board for you albeit a bit slowly. Worth mentioning it is very good with divine visitation. One of the few ways to immediately get usage out of that turn 5 and fits in a token deck for the rest quite well. At least worth trying to make jeskai or bant divine visitation deck. As mentioned, the synergy with Divine Visitation is pretty delightful. In the reddit thread for this card, it's being compared to a pseudo Bitterblossom, and I think that this is the correct evaluation of the card. It comes down early enough to create some chump blockers for you until you can Wrath the board and then Dovin can start accruing loyalty pretty quickly from there. And his ultimate will be a nightmare against other Control decks, especially if you can keep him on board with enough loyalty to do it again.